"The pilgrims headed for the base camps at Baltal and Nunwan are requested to check the status of the yatra with the control room or helpline set up by the SASB before starting off," an official said. Srinagar: The Amarnath yatra has been suspended today from the twin routes of Pahalgam and Baltal after heavy rainfall, just a day after the annual pilgrimage to the holy shrine of Amarnath began, an official said. 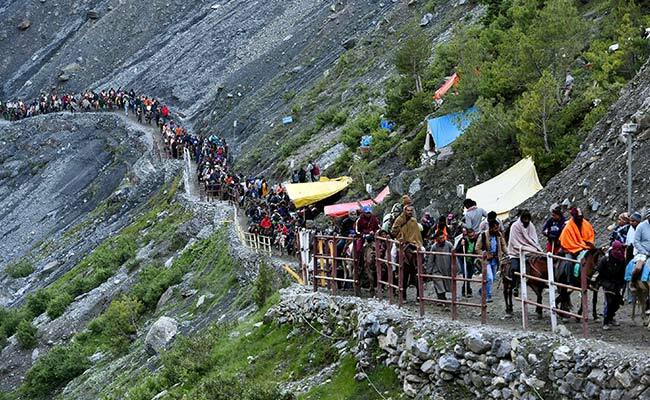 "The yatra has been suspended temporarily in view of the rains that lashed the twin routes early in the morning," an official of the Shri Amarnathji Shrine Board (SASB) told news agency Press Trust of India. "The pilgrims headed for the base camps at Baltal and Nunwan are requested to check the status of the yatra with the control room or helpline set up by the SASB before starting off," the official said. Braving inclement weather, over 6,000 pilgrims paid obeisance at Amarnath on the first day, amid tight security.